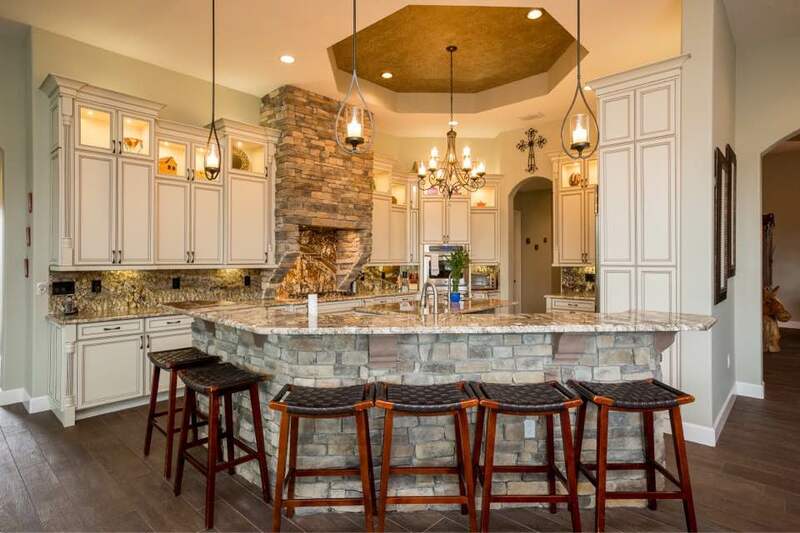 This beautiful new construction kitchen conveys a elegantly classic feel. All the natural textures and colors brings the outside to the inside. 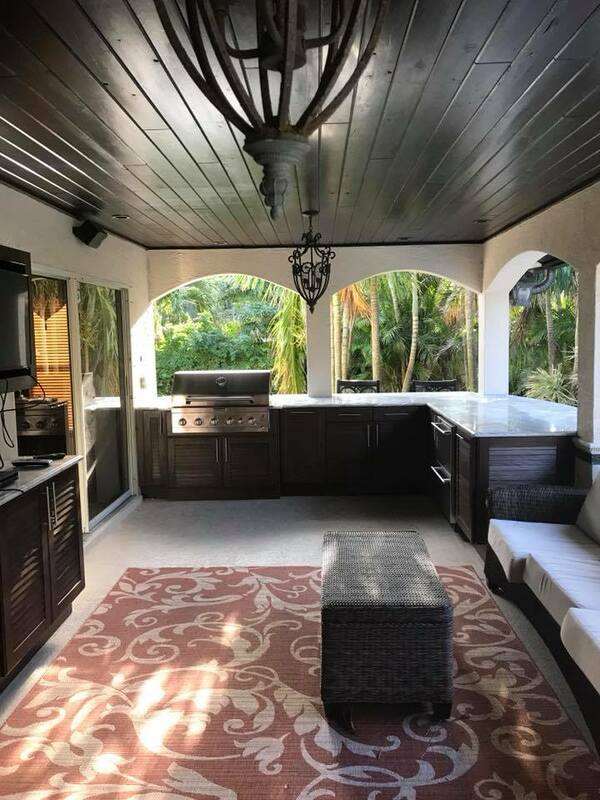 We used Marsh Furniture cabinets for this job because of their excellent build quality of their all wood cabinets and doors. 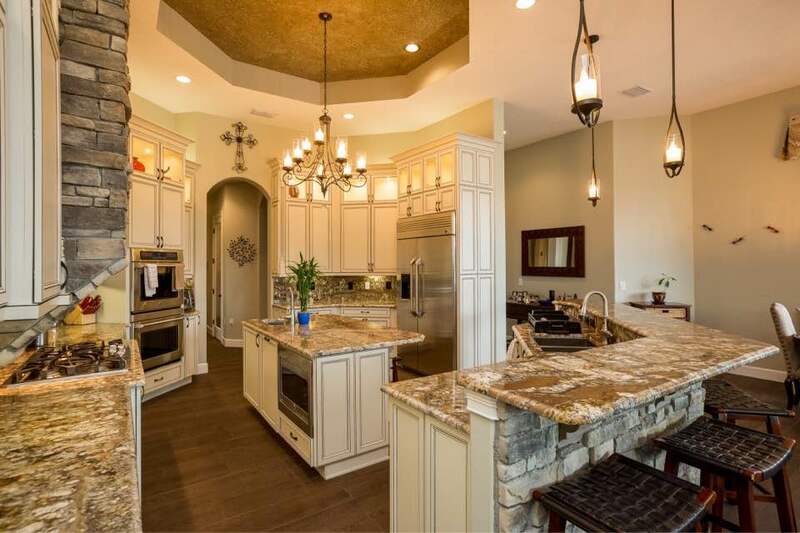 The kitchen cabinets in this home are stunning with the ivory color and chocolate glaze. The chocolate glaze on these kitchen cabinets accent the edges giving them a classic kitchen look and adding depth and texture to the kitchen cabinets. 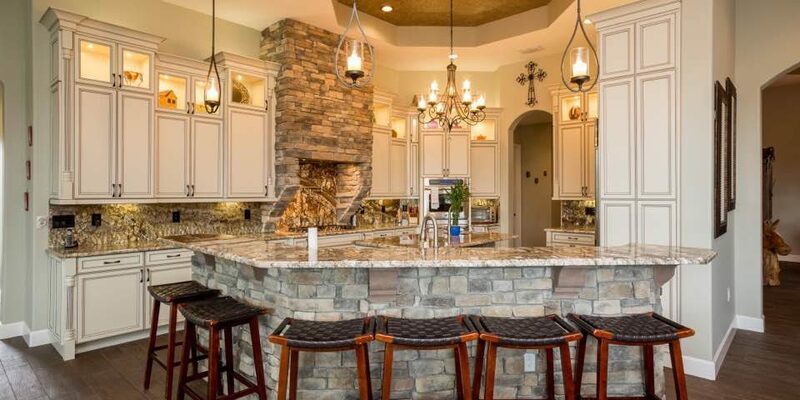 The lighted display cabinets that top the main kitchen cabinets are a great detailed touch. All of the cabinets are topped with large stacked crown molding that again adds the right amount of detail to this royally classic kitchen. 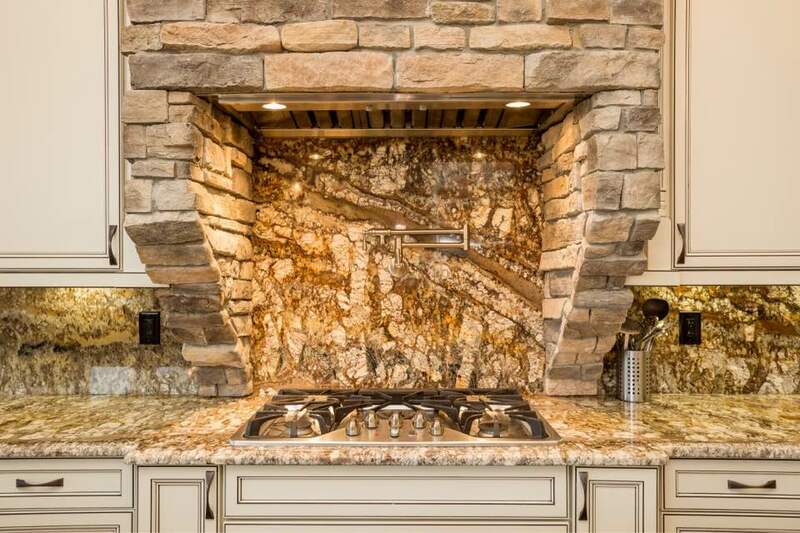 The stacked natural stone hood above the kitchen stove creates a impressive centerpiece to the kitchen cabinets and makes the kitchen feel so natural. We also used natural stacked stone for the kitchen island base which ties right into the theme of this kitchen. 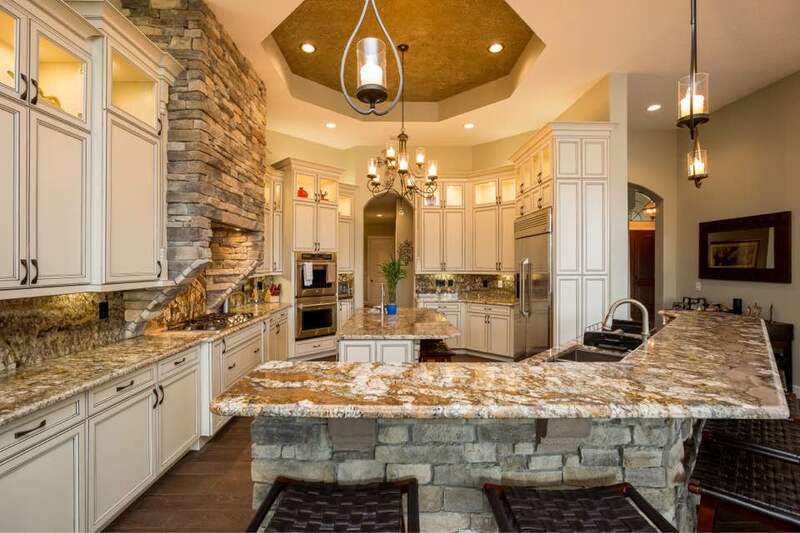 The natural granite countertops that we installed on the kitchen cabinets and kitchen island cabinets blends perfectly with the classic feel of the kitchen and natural stone textures. Countertop installation that blends well with color of your kitchen cabinets is a must when remodeling your kitchen or in new construction. 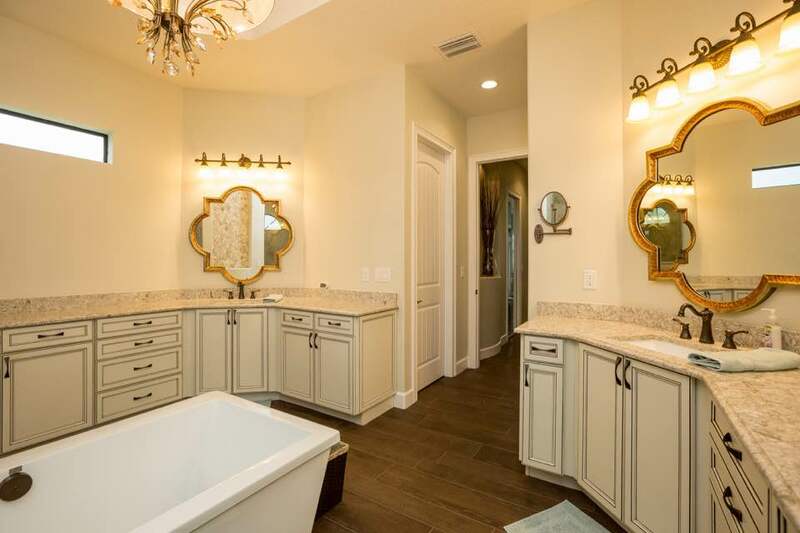 In the bathroom for this new construction home we used the same Marsh ivory cabinets with chocolate glaze. This really ties the house together with a sense of consistency. We also use a natural granite countertop that had a slightly different color and pattern. 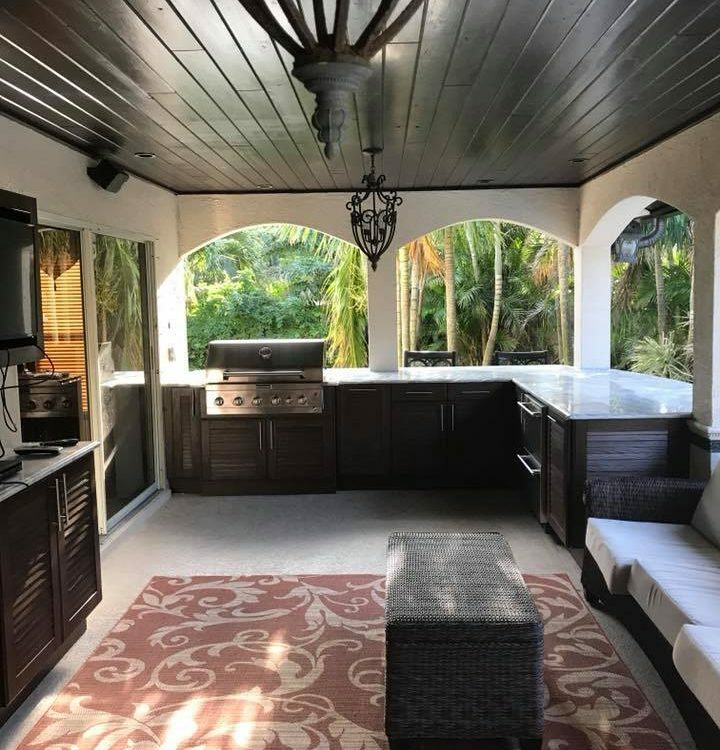 When using natural granite because of its natural nature you can get different colors and patterns from slabs that were cut in different areas of the quarry. Since we own and operate our own granite and stone facility we can make sure to get you matching slabs for each project and tailor the color for each room.